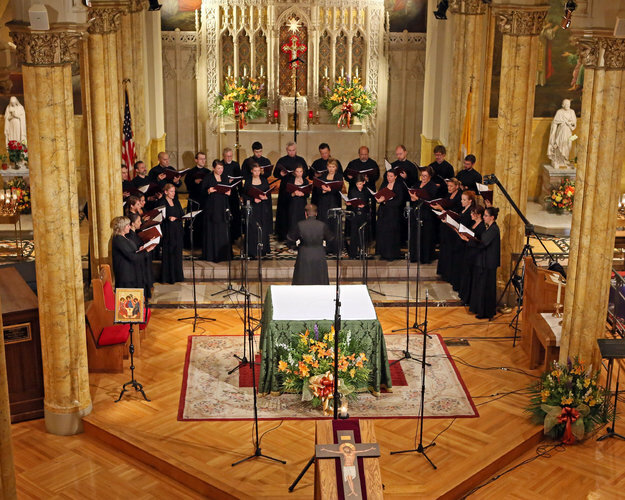 The Patriarch Tikhon Choir, a mixed-voice professional ensemble of 35 American, Canadian and Russian singers, was formed recently to focus on Orthodox Christian sacred music, a tradition it hopes to nurture in the United States. A substantial audience that included many monks turned up to hear the ensemble — named for a missionary saint who helped expand Orthodoxy in early 20th-century America — give its debut concert on Monday evening at St. Malachy’s Roman Catholic Church (the Actors’ Chapel) in the theater district. Led by Vladimir Gorbik, a conductor on the faculty of the Moscow State Conservatory, the ensemble offered a program called “Their Sound Hath Gone Forth.” It featured works from the Orthodox All-Night Vigil and Divine Liturgy, including stark centuries-old Znamenny Chant, with selections sung in both Church Slavonic and English. The chorus demonstrated an appealingly blended sound, austere and somber in the chant and joyous and more full-blooded in the works by Rachmaninoff. The arrangements and compositions by living or 20th-century Russian and American Orthodox composers included on the lineup here — like Benedict Sheehan’s “Thrice-Holy” (2012) — had nothing in the way of harmonic twists or other contemporary markers to distinguish them from the traditional pieces on the program. The polyphonic selections proved to be the highlights, in particular an arrangement by Sergius Trubachov of “Gladsome Light,” a type of chant that originated in the Valaam Monastery in northwestern Russia and blends features of Byzantine and Znamenny genres. The female, then male voices blended beautifully, quiet and reserved before swelling to a more sumptuous sound. The program concluded with “Let God Arise,” a concerto by Dmitry Bortniansky (1751-1825), in which a lone soprano soared expressively above the choir.